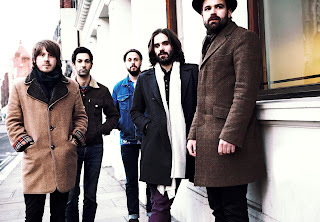 Billboard recently wrote an article about Treetop Flyers in which they called the music "throwback folk-rock". I could not have said it better myself so I won't even try. The music is current and relevant but you can clearly hear folk/Americana influences from the past. The Treetop Flyers' music is very consistent. They hold true to their own sound. If you like one song then chances are you will like the rest of them. The Hubs loves a good guitar solo and this album delivers. We both agree that our favorite song on the album is Haunted House. It has guitar solos for him and progressive dynamics for me. I wish there was a link to the song but there is not. So you will just have to buy the album to hear it (like how I did that?). You can Pre-order now here. If the Soundcloud isn't showing for you (above) then click here to watch Things Will Change on YouTube.